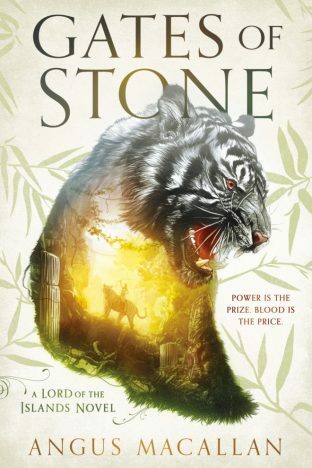 The genesis of my epic fantasy novel Gates of Stone lies in a time in the late 1980s when I studied magic, witchcraft and sorcery in Indonesia. I was a 23-year-old student at the University of Edinburgh working towards a Master’s degree in Social Anthropology and I was required to do a stint of fieldwork for my dissertation in an unfamiliar non-Western society. I chose to spend five months in a remote rice-farming village in Bali, a lovely, tranquil place but without electricity, or shops or restaurants, and with almost no residents who spoke English. It was on the slopes of the Balinese sacred mountain Gunung Agung and several hours bus travel away from the neon-lit tourist fleshpots in the crowded south of the island. I had an extraordinary time there, living in a room above a chicken house in the compound of a local bigwig, a university administrator who lived in the capital Denpasar, far to the south. This was his ancestral village but he rarely visited and I was left very much to my own devices. I was – and still am – very interested in religion, in all its many strange different faces, and also in its close cousin magic, and I had read that mainly Hindu Bali was steeped in magical practices. Witchcraft abounded, apparently. Yet having visited as a tourist a few years before and fallen in love with the beautiful island and its gentle people, I was astonished to read all about the many thousands of local witch-doctors, known as balian, and their reputation for wielding terrible eldritch powers. So off I went to Bali in the spring of 1989 determined to seek out these balian, hang out with them, interview them, discover what they truly believed and whether they were still a significant force in Balinese society. I came away from Bali that autumn a changed young man. I don’t believe in magic – I’d better say that right away – I don’t believe people can transform themselves into black monkeys or dogs or mysterious balls of fire, as the balian are said to do – and, indeed, claim to be able to do. Or that they can curse people and cause them to become sick and die with only the power of their spells, or bless them with good fortune in business for that matter. But I did experience some very strange things, some of which I can’t properly explain, even now, thirty years later. I always made it clear to my local friends and contacts in the village that I did not believe in leyak – the local word for witches. I was only doing academic research, I said, for my education. But one Balinese friend, a tough but amiable traffic policeman, told me one day, smiling, that he would convince me of the truth of his beliefs, that leyak were real. He told me he was a balian and that he was able to transform himself at will into Rangda, the terrifying Balinese demon-goddess, consort of the god Shiva, who wears an necklace of baby skulls and a belt of fresh entrails, whose breath is fire, whose nails are talons, Queen of all witches. Spoiler alert: Rangda (below) appears in anagrammatised form as the goddess Dargan in my novel Gates of Stone, and Ketut, one of the main characters, can magically transform herself just as my friend the traffic cop claimed. I went to bed early in Bali. There was nothing to do after nightfall except read by torchlight. I woke up that night at exactly midnight and my room was filled with a perfectly disgusting smell – meaty, rotten, foul. I had been having terrible nightmare of a huge face with red, bulging eyes, and fiery breath and, now awake, was stricken with a terrible sense of nameless dread. But when I got the torch on and shone it round the room, there was nobody there. And the next day, when I met him my friend, he was grinning like a man who’s won a large bet and asked me how I’d slept. He may have put all that in my mind. That’s what a psychiatrist would say. That’s how it can be explained. But the fear and smell were very real. So, how about this: after visiting an ancient and reclusive balian who lived deep in the woods towards the summit of Gunning Agung, night fell and my host suggested I stay the night. Leyak were abroad, he told me, and it would not be safe for me to travel in darkness on my own. I used to get about on a moped, in those days, which made it easy to reach remote homesteads on narrow, jungle trails. I declined the balian’s kind offer of hospitality and set off on the moped down the dark trail towards my village. In the middle of nowhere, the bike suddenly cut out. The engine stopped; the headlamp went out. I couldn’t restart it. Totally dead. Spooky. Then I saw a strange ball of yellow light about a foot off the ground coming towards me through the pitch-dark jungle. I freaked out, I was genuinely terrified. Leyak sometimes appear as mysterious balls of light. The ball of light immediately stopped heading towards me and veered away into the jungle and faded and disappeared. Miraculously, my moped started when I tried it again. Massive score for the power of Christianity. Thinking about it later, in the safety of my bed above the chickens, I came upon an alternative explanation: some kindly Balinese, knowing leyaks were active that night, and seeing some poor fellow stranded with a broken motorbike, came to offer help, carrying in his hand a hurricane lantern, of the kind commonly used in places without electricity, which give off a glowing ball of light at about knee level. Hearing this creature of the night bawling out some foul musical incantation in a strange demonic language, the would-be Good Samaritan ran away as quickly as he could. He must have thought I was a leyak, just as I did him. One final anecdote. Balian, apparently, often fight with each other in the night skies, transformed into tiny coloured spots of light. One weekend, I was in Candi Dasa, the nearest fleshpot to my village (about once a month I would go down there an eat a steak, drink a couple of beers and try to meet some tourist girls) and I was walking to a restaurant on the outskirts of the town at about dusk – completely sober, since you ask – when I saw a huge cloud of tiny lights in the sky, all different colours, red, green, blue, yellow, whirling and mingling, their flight paths criss-crossing forming strange and wonderful patterns in the darkness. I watched, amazed, for ten minutes, and then the lights dispersed and I tottered along to the restaurant and orders a much-needed beer. My first thought was fireflies – but Bali doesn’t have these creatures among its fauna. To this day, I don’t know what that was. Perhaps it was swarms of miniaturised witch-doctors battling for supremacy in a magical melée. I watched The Exorcist – live! I saw many other bizarre and wonderful things during my time there: I witnessed an exorcism, and a demon speaking through the body of the sick man, who was writhing and contorting under the balian’s ministrations. It was, in fact, very much like the 1973 movie but without the green vomit and the actress Linda Blair’s rotating head. And with the whole village watching approvingly, murmuring at the demon’s use of foul language. It was my fascination with this subject that made me want to write Gates of Stone. A good deal of the magic in the novel is derived from the my experiences in Bali – though not the “blood magic”, that the sorcerer Mangku uses. I have also borrowed heavily from the Balinese religion as well, which is a version of Hinduism. The novel is a homage to Balinese culture, and to the wider Indonesian culture, and to the kindness of the people who fed me, housed me, told me their secrets, revealed their fears and made my time in their beautiful and extraordinary island so rewarding.